ROBERT BAKEWELL was born in 1725 at Dishley, Leicestershire, England. He died October 1, 1795, at Dishley. 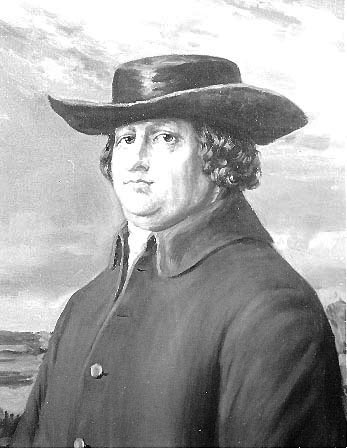 Bakewell was an agriculturist who revolutionized sheep and cattle breeding in England by methodical selection and inbreeding. He was the first to improve animals for meat production and carcass quality. Bakewell's father was a farm manager, with a farm of 440 acres (178 hectares) at Dishley. As a young man, Bakewell traveled about the country learning agricultural techniques and studying the anatomy of animals when it was a relatively unknown subject. He returned to the farm of his ailing father, who died in 1760. The younger Bakewell, as the first son with the hereditary right from his father, then assumed the management of the Dishley estate as a country gentlemen. He gathered useful stock from extensive horseback trips, welded them into a breed by deliberate and intensive inbreeding to fix type. There Bakewell became one of the first to breed both sheep and cattle for meat; previously the animals were bred primarily for wool or work. He developed the Leicestershire sheep and Longhorn cattle into good meat producers, but they were poor suppliers of milk and the cattle were later supplanted by the Shorthorns bred by the Colling Brothers. He also bred Shire horses and the Small White pig. Bakewell was very secretive about his work. Bakewell had more permanent success in developing the Leicester sheep, a barrel-shaped animal that produced long, coarse wool and also provided a good yield of high-quality meat. The first to establish on a large scale the practice of letting animals for stud, he made his farm famous as a model of scientific management. His annual auctions created great attention and an audience with Farmer George (George III). 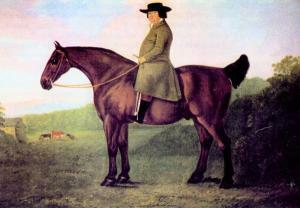 In 1783 he established the Dishley Society, forerunner of breed associations to protect the purity of his stock. That the reader might enjoy more information about Robert Bakewell, the following story is reprinted from The Breeder's Gazette. The article was first published in 1915 by Alvin H. Sanders, also publisher of this esteemed and popular publication. For many years, The Breeder's Gazette was the most widely read live stock publication in the world. Mr. Sanders, along with Arthur G. Leonard, Robert B. Ogilvie, and Richard Gibson, were the actual creators of the Saddle and Sirloin Club. "Let us call first of all upon Robert Bakewellâ€‹, patriarch of animal breeders since his time; the man who first found a shortcut to livestock improvement. He flourished about the middle of the 18th century. We do not know as much of his life as would be the case had his contemporaries realized at the time of the magnitude of his discoveries, or appreciated the far-reaching influence of his work. We know this, however, that flying squarely in the face of all preconceived notions governing the production of farm animals, he was the first of the world's great animals breeders, of which there is record, to demonstrate the power of the principle of the concentration of blood elements as the readiest and most effective method of establishing and fixing desired characteristics. The scene of his labors was at Dishley, Leicestershire, England, and his great success was made with the long-wooled Leicester sheep and Longhorn cattle, the latter then a widely distributed type in all the midland counties of Britain. His work is said to have been conducted at first with more or less secrecy so far as the public was concerned. Aware of the general prejudice existing at the time against close breeding, he probably did not care to call down criticism while still experimenting. Some have intimated that in the case of his "improved Leicesters" he was actuated by a desire to conceal one of the real sources of the betterment attained. One story ran to the effect that he had used in his earlier experiments an extraordinary black-face "tup," which no visitor was ever permitted to see, and the occasional appearance of blackish lambs among the descendants of the Dishley sheep long years later was cited as an illustration of the power of atavism or reversion to an original type even after the lapse of many generations. Naturally, progress was more rapid with the Leicesters than the Longhorns, and it was not long before the flockmasters of the entire kingdom were taking notice of the marvels being wrought. One celebrated ram, Two Pounder, is said to have earned 800 Guineas in a single season! The improvement of the Longhorns followed, and the Dishley "breed" became the prevailing popular type in all the neighboring districts. He is said to have maintained somewhat of a "museum," or as Dixon calls it, a "business room," in which there were preserved both skeletons and "pickled carcasses" illustrating interesting results attained. Among these later trophies of the Longhorns were some joints that were prized relics of Old Comley, that died at the good old age of 26, with fully four inches of outside fat upon his sirloin. The herd was distinguished above all others for its depth of flesh, and Bakewell did not for a moment doubt that he had evolved a type which would "represent the roast beef of old England forever and aye." At a sale in Oxfordshire in 1791, several of these Longhorn bulls fetched above 200 guineas each, and at Paget's sale two years later, a bull of Fowler's Bakewell stock brought, for those days, the great sum of 400 guineas. King George III became interested, and honored the wizard with a royal inquiry as to his "new discovery in stock breeding." To understand the full import of Bakewell's work, it is necessary to know that his great successes antedated the creation of all the leading breeds of the present day. He had hit upon the secret of how to accentuate specific points and insure their perpetuation. That was the one great central fact developed by his work â€” the principle that proved the forerunner of universal improvement in all the various Island types. He little dreamed that through its application to other materials his wonderful Leicesters and Longhorns would in time be put in total eclipse. The livestock kingdom of his day was one great conglomeration of local types and non-descripts. The "improved Shorthorn" was as yet only incubating along the banks of the River Tees. In the abutting counties of York and Durham were many different sorts known by various names, all of which were soon to be successfully unified by the cement of inbreeding applied so persistently by the Shorthorn fathers after a contemplation of Bakewell's handiwork. Over in Herefordshire at this same time were equally varied assortments of cattle soon to be brought together by a resort to the magic power in the hands of Benjamin Tomkins, his contemporaries and successors. At a later date, Ellman fairly made the Southdown sheep from Bakewell precendents. And so we might go up and down almost the entire line of the modern breeds and sub-varieties, and find in almost every instance that the first great results have been obtained primarily through the mating of near kin in accordance with the Bakewellian law. While his name has not been given to any of the types that owe their origin directly to his demonstrations, over in France they have created a beautiful breed of sheep, by a judicious blending of Leicester and fine-wool blood, which they call the Dishley Merino, in recognition of the great lawgiver's English home."